Plaid has assembled the most popular Simply designs into value priced packs. Chock full of inspiration, you'll go back to these packs time and again for your favorite projects. Letter size 5". Contains 13 Sheets, Letters A-Z. Craft Supplies - Item #PLA-28677 - See More Items Like This On Clearance! Stencil Decor isn't just changing with the times, but setting new standards for decorative stencils! We've got it all, from a fresh twist on retro designs to classic motifs to big, bold ideas for the daring decorator. Whether using large single motifs for head-turning focal points or all-over patterns that mimic hand-painted wallpaper or traditional borders for stunning tone-on-tone or multi-color effects, Stencil Decor designs will create the right look for rooms or entire homes in need of a makeover. 9-3/4" x 18". 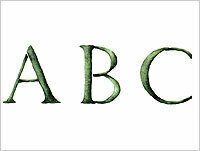 Letter size 3-3/4" X 2-3/8". Craft Supplies - Item #PLA-27755 - See More Items Like This On Clearance!